Mercy Niwe is a Program Management Officer on the Private Funding Team under the Economic Development Sector. She supports various regions with Designing Monitoring and Evaluating Programs holding the field accountable to meeting donor promise through measureable impact on sustainable child wellbeing. Mercy is passionate about empowering women and children to reach their God given fullest potential through economic modeling. Born in Uganda, Mercy experienced first-hand the realities of life in a poverty-stricken country. She pursued a Bachelor’s degree in Economics and Statistics and began a career in Uganda’s banking sector, where she soon gained an insider’s view of one developing country’s complex economic system. 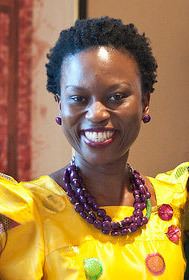 Mercy then pursued a Master’s degree in Economic Policy and Management, with concentration on economic development, from Makerere University in Kampala, Uganda. Upon completion of her Master’s, Mercy got a job with the World Bank, where her work allowed her to compare practical banking policies between wealthy and impoverished countries around the world. After two years at the World Bank, Mercy felt the need to dig deeper into the reasons for global economic disparity and what her role would be in helping the poor. It was at this point that she felt led to apply for a position within World Vision. Mercy’s program-monitoring role has allowed her to see first-hand the donor promise fulfilled in quality, community-based programs.